Pulmonary hypertension (PH) is a complex condition, one that can be frightening for patients and challenging for doctors to recognize and treat. Imagine, as a patient, being precipitously plunged from relative health to being immersed in a complex web of care, with doctors discussing invasive tests and powerful treatments involving your heart and lungs. 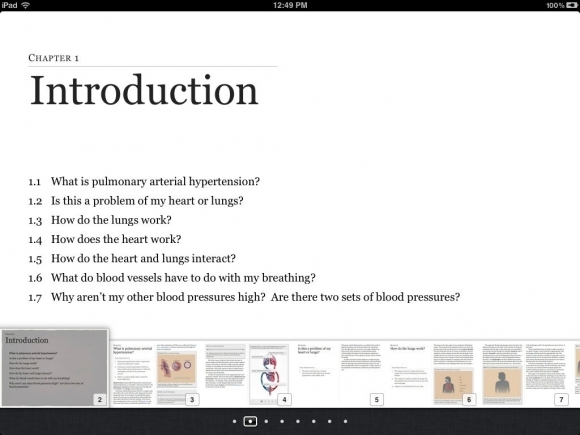 When Apple recently released their iBooks Author tool, I saw this as an opportunity to create an interactive iPad resource that lets PH patients, as well as their families and friends, explore and understand PH. A fully interactive multi-touch book like this one represents an incredibly exciting way of bringing this information to life in ways not previously possible. In creating the book, Know Your PH, I built upon work co-authored with a colleague, Dr. David Roberts, for our patient education web site KnowYourPH.org. 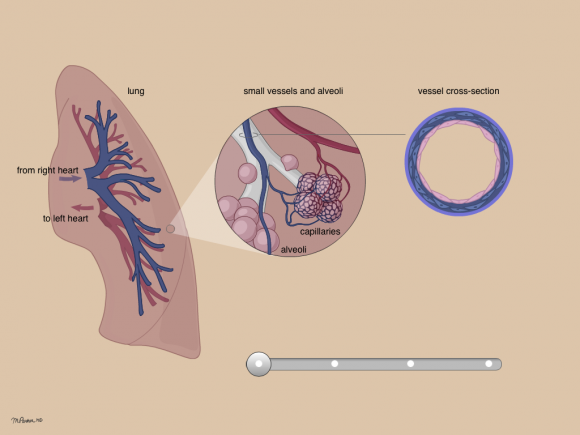 To let people better visualize the underlying mechanisms of related medical problems and symptoms, I also created a series of interactive, animated diagrams specific to the iPad and integrated with the book. My challenge has always been to place all the elements in context, so that text, audio, video, and interactivity are interwoven into a coherent piece and the reader/viewer remains “in the experience” of exploration and learning. Multi-touch books allow me to bring together all the elements seamlessly. When a person can see, hear, and touch the material in natural ways and in an immersive environment, I think there’s real power in that. By way of background and as a preface for what I’m about to tell you, I’m an MD with a computer science and engineering background from MIT, and I’ve been combining the computer side and the medicine side for the last 12 years at Harvard Medical School in creating interactive elements to help learners visualize and understand concepts in medicine. 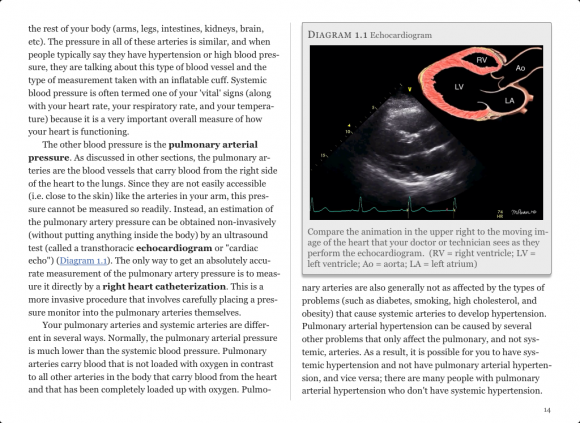 My guiding principle has always been that concepts in medicine should be conveyed as clearly and naturally as possible; my goal is to use text where appropriate and to judiciously create media and interactive graphics to help people understand topics where words alone don’t fully get the key points across. An example in the ‘Know Your PH’ book is the interactive diagram related to the progression of PH (see the screenshot below, and feel free to download the book and follow along on your iPad); in that case, I was inspired by seeing the simple sketches my colleague Dr. Roberts would draw on paper when explaining PH to patients. Those hand-drawn pieces were helpful to patients; however, static sketches are limited in their ability to convey things like changes over time and what these changes are at each level (e.g. 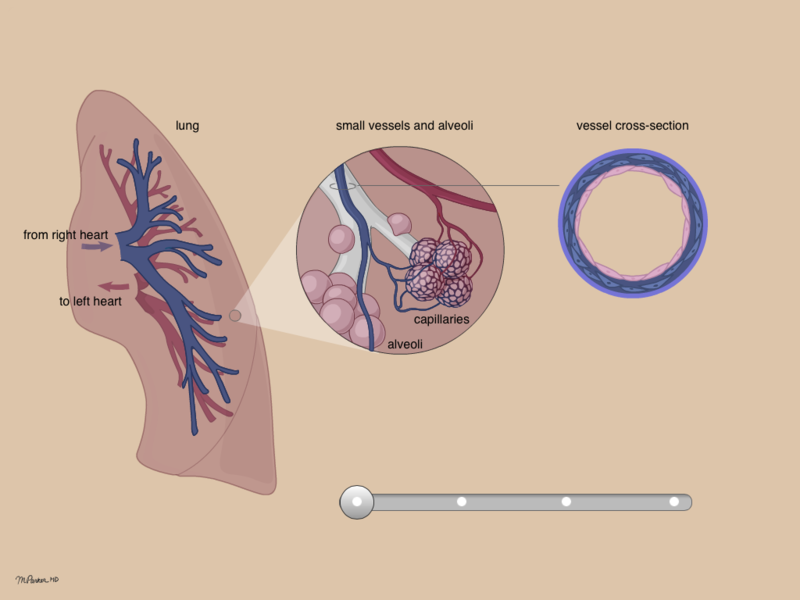 lungs, alveoli, capillaries). By creating an interactive diagram where patients could control the progression with simple touch gestures and move back and forth through the changes of PH, we can allow people to visualize the changes more easily and explore at their own pace. In some circumstances, incorporating motion and sound is the most natural way to show something. For example, pulmonary hypertension patients commonly undergo an echocardiogram (“echo”) study to look at the structure and function of the heart and to gauge pressures. Just seeing the ultrasound of the moving heart is not that meaningful for patients, partly because the images coming out of most echo machines appear largely uninterpretable to the untrained eye. The echocardiogram diagram in the book is an animation I created showing a cross-section of a beating heart synchronized frame-per-frame with an actual echocardiogram to give patients a clearer understanding of what can be seen in this particular study. In terms of creating the interactive elements, I’ve been programming in one form or another for many years, and working on interactivity and animation as well, so many of my skills were directly transferable to building these interactive graphics for the multi-touch book. My advice for those starting on the iBooks authoring process would be to apply for an account with Apple early since that may take time. Have your ISBN numbers (unique identifiers for commercially available books) in order if you are planning on selling the book on the iBookStore. There are a number of vendors, easily findable via your favorite search engine, that provide ISBN numbers. 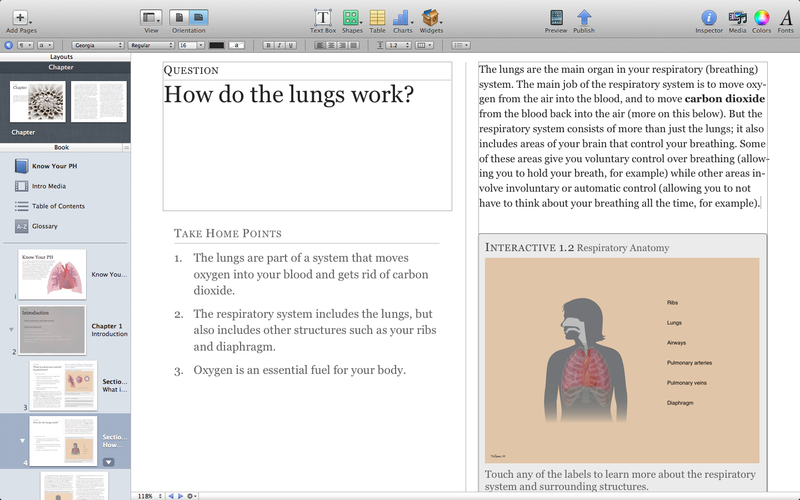 The iBooks Author tool shares some of the concepts and interface elements from Apple’s Pages program, so those who have used that program will have a slight head start. For interactivity, Apple provides a set of widgets that lets you incorporate some nice elements into your book even without programming experience. Plan to work on the content as if you were creating a full-fledged book; multi-touch books require great content if you want to connect with patients and provide real benefit to them and those close to them. We’re just beginning to tap the potential of new ways of helping people understand and cope with illness, and to me, that’s very exciting. Thanks for the article Michael its really interesting and the book looks great. As I am sure you are aware the media that goes into these ebooks are key in making them stand out from their paper counterparts. What would your advice be to somebody who has not got a background like yours, that allows for the production of professional interactive media, animations and graphics. Where would you have gone if you weren’t able to produce the graphics yourself? Joshua: Thanks – I appreciate the nice words about the article and the book! In answer to your question, it depends on the budget. I would say to see how far you can get yourself before you turn to more costly routes. 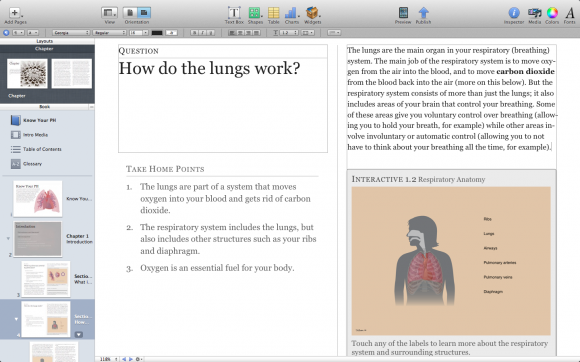 As I mentioned in the article, my advice would be to first check out the types of interactivity (called widgets) that Apple provides out of the box along with the iBooks Author tool. There are some nice pieces there that don’t require programming. For the more custom interactive work, there will likely be a growing ecosystem, depending on the economics of these types of books, of providers offering custom elements and services. The tool is so new that we’re just at the start of this.